Almost 10 years after digital photography started replacing silver-halide technologies for everyday use, there is still no equivalent to the user experience that the instant cameras (Polaroid) of yesteryear used to offer. With a digital camera (or a good mobile phone), you can take pictures and immediately visualize them, email them or post them on social networking sites, but you still need a relatively bulky equipment to print pictures. Distributing prints during a party of a social event – a very common (although expensive) practice in the Polaroid days, now requires some planning: you need a laptop, a printer, a table and one or two power outlets – a far cry from the press-the-shutter-release-share-the-print experience of instant cameras. Polaroid POGO printer next to a Pictbridge compatible camera. A picture taken by the camera and printed on the PoGo is shown next to a business card. The business card is a bit wider than the printed picture. A few weeks ago, Polaroid started selling a relatively low end digital camera (5MP), the PoGo Instant Digital Camera , equipped with a built in printer. It is a welcome evolution from the PoGo Instant Printer they launched last year. 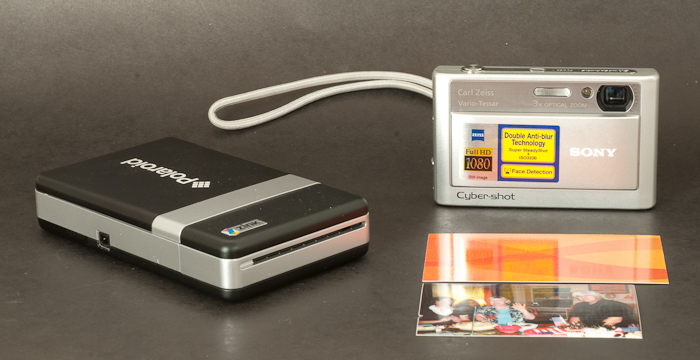 In both cases, Polaroid is using a technology developed by a company named ZINK (for Zero INK). In a nutshell, ZINK is using a thermal paper containing cyan, yellow and magenta crystals, which are revealed by the heat provided by the printer head. Apart from the paper itself, no consumable is needed, and the process does not use any liquid and produces no waste. It does not need a lot of power either, and can be packaged in a pocket sized device powered by Lithium-Ion batteries. The PoGo Instant Printer was the first product based on ZINK technologies to be widely available in the US. The size of a paperback book, it fits in a large pocket. It is battery powered, contains a pack of 10 sheets of ZINK paper, and is ready to use provided you find a cell phone or a camera compatible with it. cell phones can only connect to the PoGo if a “Bluetooth print” driver has been implemented by the phone manufacturer. Polaroid published a long list of compatible phones, but it does not include the iPhone or any Android device, or any phone brought to market during the last 18 months. It looks as if the cell phone makers (and the carriers) had stopped supporting the PoGo technology. Too bad. digital cameras supporting the PictBridge standard. Pictbridge is an industry standard adopted by the major manufacturers of digital cameras. I tested the PoGo printer with a tiny Sony Cybershot T20, and with a Nikon D80. In both cases, it is necessary to use the USB cable provided with the camera. The PoGo is very sensitive to the connection sequence (practice before you use it in public for the first time) but once you know what to connect and power on first, it works as advertised: select the picture to print on the camera, activate the Pictbridge “print” command, and after sixty seconds, the PoGo magically ejects a print. It has to be noted that the PoGo only prints JPEG files (no RAW files – convert them to JPEG in the camera before printing). The prints are small – 7.5cm x 5.0 cm (approximately 2×3″). Since the camera and the PoGo printer are directly connected, all the adjustments to the images have to be done through the menus of the camera. The color balance is difficult to set right – the pictures coming from the Sony T20 tended to have a pinkish-redish hue, the pictures coming out of the Nikon D80 were a bit yellow, but it can be fixed. The definition of the pictures is surprisingly good, and dynamic range of the prints is acceptable: the shadows are detailed, but the highlights tend to be a bit washed. The prints are perfectly usable, and thanks to their small size, they will fit in a wallet between two credit cards. The PoGo printer is a first attempt at producing a really pocketable printer. It works relatively well, and is not very expensive ($40 for the printer, $0.30 per print), but it it is not very practical to use and looks a lot like a proof of concept for the ZINK process. cameras have to be connected to the printer with a USB cable (the printer only offers Bluetooth connectivity for cell phones, and does not support WiFi). Its battery is depleted after 15 images have been printed, and the power brick is as large – and heavier – than the printer itself. 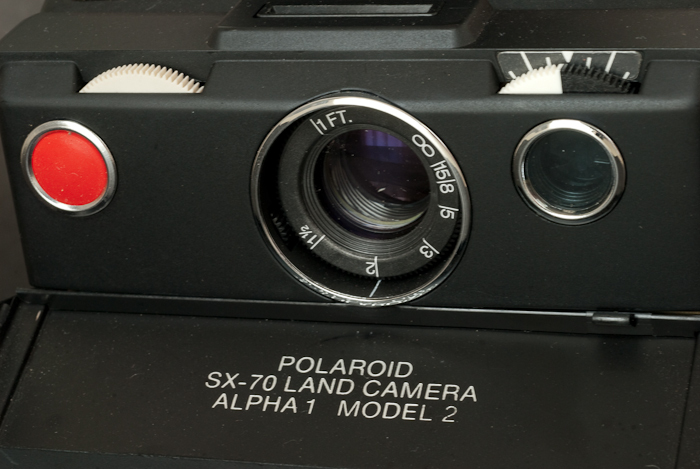 Polaroid SX-70 Alpha 1 Model 2. The lens (4 glass elements with close focus capabilities) is much better than the single element plastic lens used on the non folding Polaroid cameras such as the One step. The Impossible Project’s PX100 – the ultimate “low-fidelity” film ? Manufacturers of Instant Cameras and Instant Film used to cater to two main audiences: the professionals who needed photographic documentation for insurance claims or real estate listings, and amateurs looking for the instant gratification of seeing on paper what they had shot. When they used instant cameras, the professionals did not face the risk of receiving bad pictures from the photo lab two days after they had left their customer, and the amateurs bringing their instant camera at a party or a reunion could show and share their pictures with their friends and guests, right on the spot. Polaroid SX-70 with PX100 film pack. The black and white instant film is not manufactured by Polaroid, but by the Impossible Project. With a 100 ISO sensitivity, it's compatible with the original SX-70 color film from Polaroid. The professionals who used instant film cameras now use digital technologies to produce their reports or leaflets, and casual photographers use their cell phones to take pictures, that they forward electronically to their friends, or share on social networking sites. Printing digital pictures requires some extra hardware – a photographic quality printer – and the effort of manipulating memory cards or USB cords while navigating in complex menus. Sharing prints during a party or a reunion will obviously requires some planning. For the people who still prefer the no-fuss experience of instant cameras, Fujifilm is still selling its Instax line of cameras and film. Take a few pictures with the PX100 film, created by the Impossible Project for the Polaroid SX-70 cameras, and it becomes evident that a completely different audience is targeted. It’s not about ease of use or instant gratification – the image has to be kept in the dark during the development process and takes more than a few minutes to reveal itself. 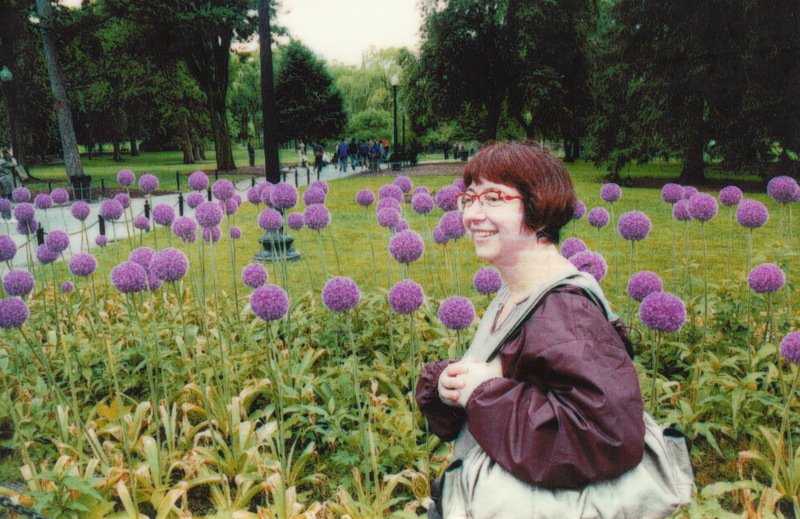 In fact, it’s not about gratification at all: the images have a very low resolution, an extremely low contrast, and have to be scanned and reworked in Photoshop to be barely usable. I was so puzzled by the results that I checked what other users of the PX100 were posting on Flickr (check those groups: polapremium and PX100) and I read the same story over and over. People who want to be polite talk about a “touchy” film, the positive minded guys discuss work arounds, but the truth is that the PX100 Instant Film is not a reliable photographic medium. The fans of Holga cameras started the “low-fidelity” or “Lo-fi” photographic movement a while ago (check my test of the Holga 120CFN). When you use a Holga camera, you put a very decent roll film elaborated by Kodak or Fuji in a camera of very questionable quality, and you sometimes get interesting results. 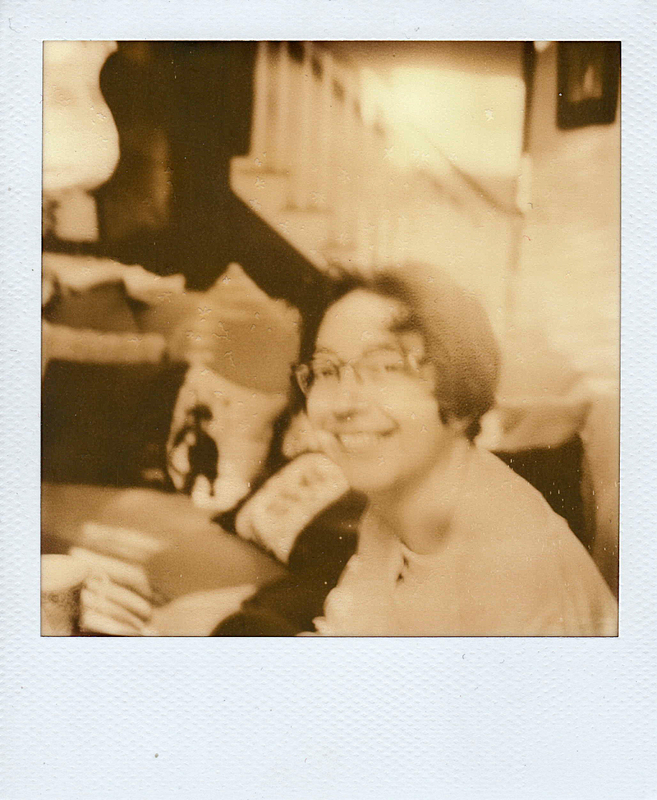 When you put PX100 film in a nice Polaroid SX-70 camera from the 1970s, it’s just the opposite. 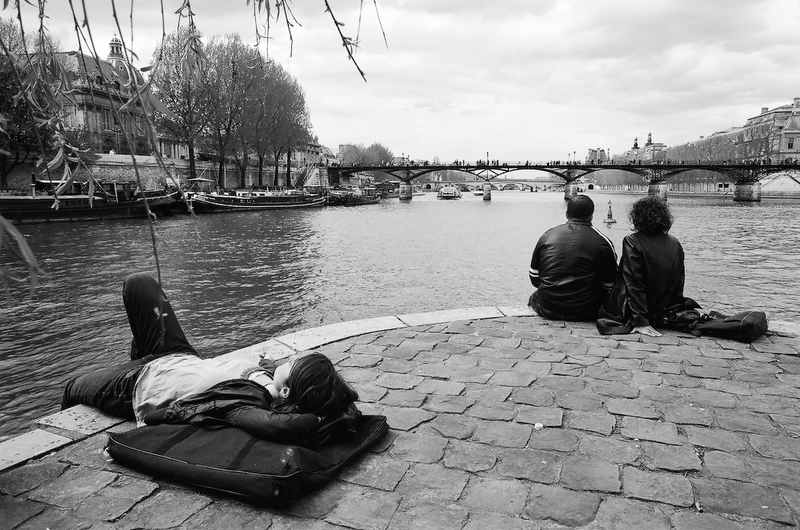 The camera may be good, but the behavior of the film is largely unpredictable. 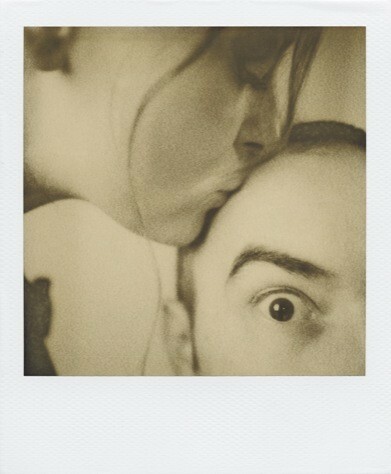 A positive note to conclude: the Impossible Project started shipping its PX600 film this week. It’s supposed to be more usable. Color film will follow in a few months. Check the Flickr groups to see how they perform. 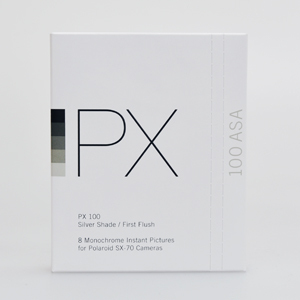 Today, March 25th, the Impossible Project (www.the-impossible-project.com) started accepting orders for its new black-and-white instant film for SX 70 Polaroid cameras, the PX 100 Silver Shade. 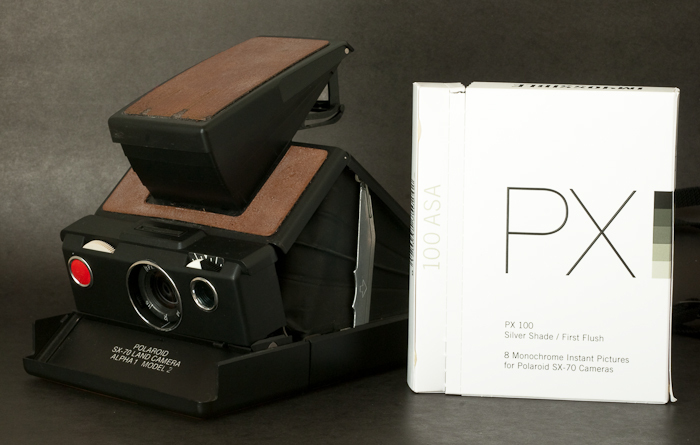 Produced in a plant which used to belong to Polaroid, the PX100 is presented as the first member of a new family. It will be followed by another black-and-white film pack for the cameras of the 600 series, and later this year, by color film for SX 70 and 600 cameras. Instant film had never totally disappeared – Fujifilm still manufactures cameras and film for the amateur photographer market (the Hello Kitty generation) as well as the peelable film compatible with the Polaroid 100 format used by committed medium format photographers. But the return of the SX 70 and 600 film formats is an important milestone, and a new sign of the rebirth of silver halide as the technology of choice for creative and experimental photography. The customers buying the new SX 70 compatible film will probably be very different from the real estate agents, insurance adjusters and young moms who formed the target audience of the original SX 70 cameras. The Impossible Project’s site obviously targets a niche of amateurs and pros who want to take pictures differently, and are looking for out of the norm results. The focus will not be on the fidelity of the reproduction of tones or on the sharpness of the pictures – that’s what digital cameras are there for nowadays. The SX 70 film will find its place in the tool box of amateurs of “weird and artistic photography”. I’m waiting impatiently to receive my first film pack.